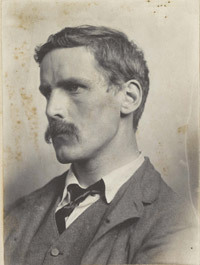 Thomas Graham Balfour (1858-1929) was RLS’s cousin and biographer. He was also an educationist. Balfour was born to Thomas Graham Balfour (senior) and Georgina Prentice. Balfour married Rhoda Brooke in 1896 and the couple had two sons. 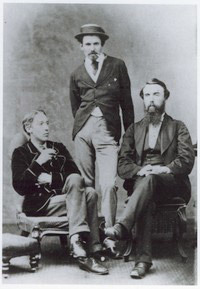 Balfour lived in Vailima with the Stevenson family during the last two and a half years of RLS’s life. While critics see this as a well-written and useful account of RLS’s life, the work has also been negatively assessed. For example, some authorities argue that Fanny was able to assert too much authorial control over the biography. Indeed, Sidney Colvin originally wished to complete the biography, but disputes with Fanny led him to drop the project. Alison Cunningham, “Cummy” (1822-1913), was RLS’s nurse. Born in Torryburn, Fife, Cummy was a strict Calvinist. She became RLS’s nurse in 1852, remaining in the household until November 1872. She was deeply devoted and loyal to the Stevensons and loved RLS. Cummy’s religious views had a strong influence on the young Stevenson: “if Louis spent, as he tells us, ‘a Covenanting childhood’, it was to Alison Cunningham that this was due. (Graham Balfour, The Life of Robert Louis Stevenson [London: Elibron, 2005], pp. 30-31). Recent critics have suggested that Cummy’s relationship with RLS was problematic – for example, that her religious views were damaging to his health, his ill and feverish imagination turning religious stories into nightmares. But her religious views probably also inspired Stevenson, sparking the beginnings of ideas for what he would later write. Perhaps, though, this strict Christianity also influenced RLS’s decision in his early twenties to abandon the Christian faith (a decision which particularly hurt his father). (Robert Louis Stevenson, A Child’s Garden of Verses [New York: Charles Scribner’s Sons, 1895], p. ix). Indeed, Cummy’s diary (Cummy’s Diary, preface by Robert T. Skinner [London: Chatto and Windus, 1926]), which she kept when the Stevensons travelled in Europe in 1863, gives a valuable insight into the kind of woman she was. The diary shows that she had a sense of humour and was preoccupied by issues like religious and national difference. After Stevenson’s death, Cummy attracted some celebrity. A Child’s Garden of Verses had become increasingly popular in the early twentieth century. Many people wanted to meet the woman who had inspired and nursed RLS. Cummy seemed to enjoy the attention, delighting in talking about her time with Stevenson. 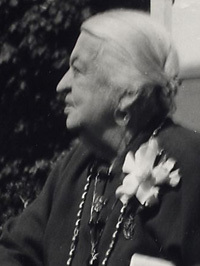 Alison Cunningham died at the age of 92. “I am sick to death of the matter and the notion of any quarrel has made me feel quite ill. It is of course very unfortunate that my story was written first and read by people and if they express their astonishment it is a natural consequence and no fault of mine or any one else. I assume that you know me sufficiently to be sure that I have never alluded to the matter even to friends who have spoken of ‘The Nixie’. I trust this matter is not making you feel as ill as all of us. Katharine Elizabeth Alan Stevenson de Mattos (1851-1939) was RLS’s cousin and Bob Stevenson’s sister. She was born to Alan Stevenson and Margaret Scott Jones. She married William Sydney de Mattos (b. 1851) and the couple had two surviving children. Katharine became an author, writing under the pseudonym of Theodor Hertz-Garten. RLS and Katharine played together when they were children, and she visited the Stevensons’ home in Bournemouth. Katharine had a close relationship with RLS (who dedicated Dr Jekyll and Mr Hyde to her). Then, in March 1888, they quarreled after Fanny Stevenson published the short story “The Nixie”. W.E. Henley accused Fanny of plagiarizing the story from Katharine’s own. RLS took his wife’s side, hurting Katharine’s feelings and alienating himself from Henley. 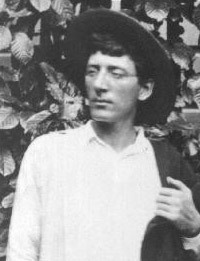 Samuel Lloyd Osbourne (1868-1947), known as Lloyd, was RLS’s step-son. He was born in San Francisco to Samuel and Fanny Van de Grift Osbourne. Lloyd went with his mother and sister Belle to Europe when they were pursuing their art studies. In 1876 when they went to Grez, the family met RLS. After the marriage of his mother and RLS, Lloyd accompanied the Stevensons on many of their travels, settling with them at Vailima. He and his sister Belle wrote about RLS and their experiences in Samoa in Memories of Vailima (1902). Lloyd also wrote about RLS in An Intimate Portrait of Robert Louis Stevenson (1924). During a rainy holiday in Scotland when Lloyd was twelve, he and RLS drew a map, which inspired Stevenson to write Treasure Island (1883). He dedicated the novel to his stepson. Lloyd and RLS collaborated on The Wrong Box (1889), The Wrecker (1892) and The Ebb-Tide (1894), although critics have debated on the extent and importance of Lloyd’s contributions. After RLS’s death, Lloyd continued to write, although he was not very successful. He published more than a dozen novels, for example Baby Bullet: The Bubble of Destiny (1905), Three Speeds Forward: An Automobile Love Story with One Reverse (1907), and Peril (1929). Wild Justice (1906) is a collection of short stories about Samoa. Lloyd married his first wife, Katharine Durham, in Honolulu in 1896. The couple had two children, Alan and Louis, and divorced in 1914. In 1897, Lloyd became the American Vice Consul in Samoa to the United States. In 1916, he married and divorced again. In 1936 he had a son, Samuel, with Yvonne Payerne, a young woman he’d met in France. In 1941 Lloyd returned to America and died in California in 1947. Robert (Bob) Alan Mowbray Stevenson (1847-1900) was Stevenson’s cousin and lifelong friend. He was born in Edinburgh to Alan Stevenson and Margaret Scott Jones. An aspiring artist, Bob studied at the Ecole des Beaux Arts in Antwerp in 1873. During the 1870s, he became part of the communities of artists working in Fontainebleau and Barbizon. RLS often visited him, and of the two cousins it was Bob who first met Fanny and Belle Osbourne (who he admired). In 1881, Bob married Harriet Luisa Purland and the couple had a son in 1894. Unfortunately, Bob had little success as a painter, but gained a strong reputation as an art critic. Bob and RLS first became friends when Bob was studying at Edinburgh Academy and living at Inverleith Terrace with RLS and his parents. They later cemented their friendship in 1871, when Bob returned to Edinburgh to live with his widowed mother. RLS and Bob were both members of the Speculative Society at Edinburgh University. They were also members of the LJR (Liberty, Justice, Reverence) League, a club founded with friends like Charles Baxter in a pub in Advocate’s Close, Edinburgh. The club’s tenet was “disregard, everything our parents taught us”, a sentiment Thomas Stevenson found deeply upsetting. Indeed, RLS’s father disapproved of Bob, blaming him for his son’s lack of religious faith. Nevertheless, RLS and Bob had a strong relationship which was marred by a quarrel between RLS and W.E. Henley in March 1888. The quarrel was over a story Bob’s sister, Katharine de Mattos, had written. According to Henley, a story Fanny published, “The Nixie”, was plagiarized from Katharine’s original story. Bob took the side of his sister and Henley, and his relationship with RLS suffered. Bob may also have felt embarrassed about the fact that RLS had been helping to support him, sending him £40 a year from 1887. In addition, in 1881 Bob married Harriet Purland; in a Letter of 1888, RLS says “Two of [my old friends] have married wives who love me not” and the editor supposes that this refers to Bob and Simpson (Letters , ed. Booth and Mehew, vol 6, p. 135 and n.). However, towards the end of RLS’s life, the two exchanged more congenial letters. Bob is apparently the model for Peter Van Tromp in “The Story of a Lie” (1879, where in “the gaudiest cafés” of Paris “he might be seen jotting off a sketch with an air of some inspiration”), for “The Young Man with the Cream Tarts in New Arabian Nights (1882, dedicated to Bob), for Paul Somerset in ‘“Edifying Letters of the Rutherford Family” (probably written 1876-7) and again in The Dynamiter (1885), the Prince in Prince Otto (1885) and Stennis ainée in The Wrecker (1892). Indeed, Fanny Stevenson says “whenever my husband wished to depict a romantic, erratic, engaging character, he delved into the rich mine of his cousin’s personality” (“Prefatory Note”, New Arabian Nights, Tusitala Edition, p. xxviii). The people who knew Bob considered him to be extraordinarily intelligent, a fascinating and engaging character who unfortunately was unable to achieve his artistic goals. In “Talk and Talkers: I”, RLS calls Bob “Spring-Heel’d Jack” and praises “the insane lucidity of his conclusions, the humourous eloquence of his language” (“Talk and Talkers I”, in Memories and Portraits, The Works of Robert Louis Stevenson, Swanston edn, vol ix [London: Chatto and Windus, 1911], p. 87). “I wandered away from Louis, gathering shells, but was recalled by a wild shout. I found Louis bending over a piece of the outer reed that he had broken off. From the face of both fractures innumerable worms were hanging like a sort of dreadful, thick fringe. The worms looked exactly like slender earthworms, more or less bleached, though some were quite earthworm colour. They lengthened out and contracted again until I felt quite sick and had to fly from the sight. Frances (Fanny) Matilda Van de Grift Osbourne (1840-1914) was RLS’s wife. She was born in Indianapolis to Jacob Vandegrift and Esther Thomas Keen. 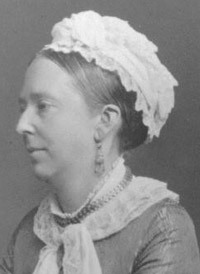 In 1857, Fanny married Samuel Osbourne. The couple had three children: Isobel (Belle), born in 1858, Samuel (Lloyd), born in 1868, and Hervey, born in 1871. Sadly, Hervey died in 1876 after a long illness. Fanny and Sam had a turbulent married life. They moved frequently within the US, and were often separated while Sam tried to make his fortune. Sam was often unfaithful and in 1875, Fanny left him. She took the children to Europe where she and Belle pursued their art studies. In 1876 they arrived in Grez and it was here that she met RLS. A year later, Fanny and RLS had become close, and perhaps romantically involved, but in 1878, Fanny and the children returned to her husband in California. Against the wishes of his friends and family, RLS resolved to pursue Fanny. In 1879 he traveled by train across America to California (he later described this journey in The Amateur Emigrant ). Fanny divorced Sam, and she and RLS were married in San Francisco in May 1880. The couple honeymooned in Napa Valley and RLS later wrote about this in The Silverado Squatters (1884). Although at first RLS’s parents disapproved of the marriage, they came to love Fanny and welcomed her as part of the family. RLS’s friends, however, were not persuaded, and many never came to like her. Several disapproved of the fact that Fanny was ten years older than RLS and married when he met her, but they also disliked her mannerisms and influence on RLS. She was also fiercely protective of RLS’s health and discouraged friends from visiting when he was unwell. This interference was often resented and the marriage put a strain on many of RLS’s friendships. Literary critics and biographers have also shown keen animosity towards Fanny, suggesting she took too much control over his life and writing. Fanny was, however, very proud of her husband’s work and collaborated with him on The Dynamiter (1885). She also claimed to have told RLS to rewrite an early draft of Jekyll and Hyde (1886) to make it the masterpiece it is today – however, there is no proof that this was the case. From Songs of Travel, The Works of Robert Louis Stevenson, Swanston edn, vol xiv (London: Chatto and Windus, 1911), pp. 235-36. After RLS’s death in 1894, Fanny, Belle and Lloyd stayed at Vailima for a few months. For the next couple of years, Fanny lived in various places in California and Hawaii, and travelled to Europe. She settled in Santa Barbara, CA in 1908. From her house, “Stonehenge”, she worked on the publication of the journal she kept on board the Janet Nicholl. Fanny had two significant relationships after her husband’s death. Her first was with Gelett Burgess (1866-1951), who had designed the bronze panels for RLS’s tomb. Her second was with Edward (Ned) Salisbury Field (d. 1936), a journalist who was her companion and secretary until her death in 1914. Just six months later, Belle married Ned Field and together they took Fanny’s ashes to be buried with RLS’s. Jolly, Roslyn, “Women’s Trading in Fanny Stevenson’s The Cruise of the Janet Nichol”, in Economies of Representation, 1790-2000: Colonialism and Commerce, ed. by Leigh Dale and Helen Gilbert (Aldershot: Ashgate, 2007), pp. 143-55. Lapierre, Alexander, Fanny Stevenson (Paris: Robert Lafont, 1993). English translation: Fanny Stevenson: Muse, Adventuress & Romantic Engima (Fourth Estate, 1995). – – – , Fanny Stevenson: Entre passion et liberté (Paris: Robert Laffont, 1993). Lucas, E.V., The Colvins and Their Friends (London/New York: Methuen/Scribner’s, 1928). Sanchez, Nellie Van de Grift, The Life of Mrs Robert Louis Stevenson (New York/London: Charles Scribner’s Sons, 1920). Stevenson, Fanny, The Cruise of the Janet Nichol (London/New York: Charles Scribner’s Sons, 1915). – – – , The Cruise of the Janet Nichol among the South Sea Islands. A Diary (London: Chatto & Windus, 1924). – – – , Stevenson, Fanny Van de Grift , The Cruise of the “Janet Nichol” among the South Sea Islands, ed. by Roslyn Jolly (Sydney: University of New South Wales Press, 2003). Also University of Washington Press, 2004. “Place of Birth: 8 Howard Place, Edinburgh. Time of Birth: Wednesday, 13th November, 1850 at 1:30 p.m.
Color of Eyes: Blue at first turning to hazel. Color of Hair: Very fair almost none at first. 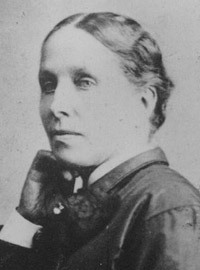 Margaret Isabella Balfour Stevenson (1829-1897) was RLS’s mother. She was 1 of 13 children born to the Reverend Lewis Balfour, the minister of Colinton, and Henrietta Scott Smith. RLS often visited Colinton (which was then a separate village just beyond Edinburgh and is now within the city) as a child. “Maggie” (as she was known to her family) married Thomas Stevenson in 1848 and gave birth to RLS in 1850. She had a strong and loving relationship with her son. Although quarrels between RLS and his father about religion, his career and his marriage were upsetting to the family, the family remained close. After her husband died in 1887, Maggie went with RLS and Fanny on their travels to America and the South Seas and even settled with them in Vailima. She returned to Edinburgh to live with her sister after RLS died. Sandison, Alan, ‘The Shadow of Jocasta: Margaret Stevenson & Son’, Rivista di Studi Vittoriani 20 (2007), pp. 31-54. This was a special Stevenson number of the journal. 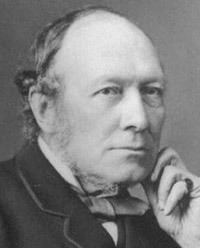 Thomas Stevenson (1818-1887) was RLS’s father. Thomas followed in his father Robert Stevenson’s (1772-1850) footsteps, becoming a lighthouse engineer in the family firm. He designed more than thirty lighthouses. Thomas was a Scottish Calvinist, and a firm believer in the importance of the Christian faith. He married Margaret Isabella Balfour in 1848, and two years later, RLS was born. Thomas had a strong bond with his son, despite quarrels over religion, RLS’s refusal to become an engineer or to continue law professionally, and RLS’s decision to marry Fanny Van de Grift Osbourne. Despite his initial unhappiness, Thomas developed a good relationship with his daughter-in-law and he and Stevenson remained close throughout his life. RLS wrote about his father in the essay “Thomas Stevenson, Civil Engineer” for The Contemporary Review in 1887. The essay was later included in Memories and Portaits (1887). (Belle Strong, taken from a journal entry for 24 September 1894 and included in Memories of Vailima, by Isobel Field and Lloyd Osbourne [New York: Scribner’s, 1902], pp. 96-97). (Robert Louis Stevenson, from An Object of Pity, jointly written by Stevenson, his family and friends as a joke [privately printed in Sydney in 1892], quoted in Stuart Campbell RLS in Love [Dingwall: Sandstone Press, 2009], pp. 41-42). Isobel (Belle) Osbourne (1858-1953) was RLS’s step-daughter. She was born in Indianapolis to Samuel and Fanny Van de Grift Osbourne. Both Belle and her mother were interested in art and became art students in Paris. In 1876 Belle, her brother Samuel (Lloyd) Osbourne and Fanny went to an art colony in Grez, France, where Fanny met RLS. Belle married the artist Joseph Strong (1853-1899) in 1879 and gave birth to a son, Austin Strong (1881-1952). In the 1880s, the Strongs lived first in San Francisco (where they helped give a memorable studio party for Oscar Wilde in the spring of 1882). and Joe Strong came up to stay with the Stevenson party in Silverado and Calistoga where he drew pictures of the miners’ cabin and proved “a most good-natured comrade and a capital hand at an omelette”. In 1882 they went to Hawaii. The Stevensons met up with them there when the Casco arrived in Honolulu in January 1890. Joe Strong had a drink problem and was not an ideal husband; trying to help, RLS took him on the Equator cruise as photographer (July-December 1889, ending in Samoa) and sent Belle and Austin to Sydney with a small allowance. 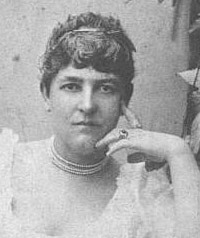 Belle later joined Stevenson at Vailima in May 1891, where she became his valued “amanuensis”, transcribing his fiction to dictation when he was too ill to physically write himself. She and her brother Lloyd wrote about RLS and their experiences in Samoa in Memories of Vailima (1902). Joe also came to Vailima in May 1891, but his irregular life caused problems. Belle finally divorced him in 1892. In 1914, she married her mother’s secretary (and possibly lover), the journalist Edward (Ned) Salisbury Field (d. 1936) just six months after Fanny died. Together, Belle and Ned took Fanny’s ashes to Mount Vaea, where RLS was buried. In the 1920s the Fields became rich after they found oil on their land. Belle wrote her memoirs in This Life I’ve Loved (1937).